The 2015 Infiniti Q70 is a showcase of advanced technologies. It embraces the essence of all things Infiniti – style, performance, luxury, craftsmanship and technology. For 2015, the showcase expands, literally, with the arrival of the new extended wheelbase Q70L version, along with an enhanced exterior design and a growing list of industry leading technologies such as Predictive Forward Collision Warning (PFCW) and Around View® Monitor with Moving Object Detection. The 2015 Q70’s revised exterior includes new front and rear fascias, new grille design, Infiniti signature LED headlights, LED taillights, LED fog lights and side rearview mirrors with integrated LED turn signals. The optional Sport Package also receives new sport front and rear fascias. In addition, three new exterior colors have been added for 2015: Hermosa Blue, Chestnut Bronze and Graphite Shadow. A special premium Pearl finish is also available with the Moonlight White exterior. 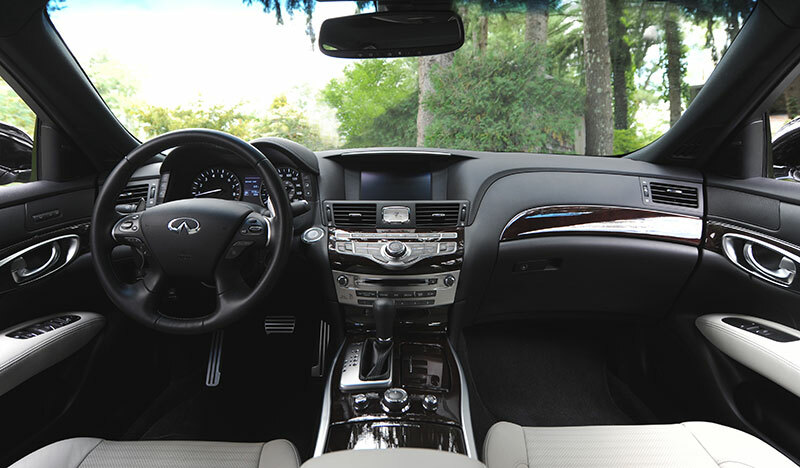 The 2015 Infiniti Q70 also includes revised interior content and trim, with leatherette replacing leather-appointed seating on base Q70 grades. Other changes include revised 18-inch aluminum-alloy wheel designs and the addition of available Backup Collision Intervention (BCI). The Infiniti Q70 is now offered in a total of nine models, starting with the Q70 3.7, Q70 3.7 AWD, Q70 5.6, Q70 5.6 AWD and Q70 Hybrid. The new long wheelbase lineup includes the Q70L 3.7, Q70L 3.7 AWD, Q70L 5.6 and Q70L 5.6 AWD. 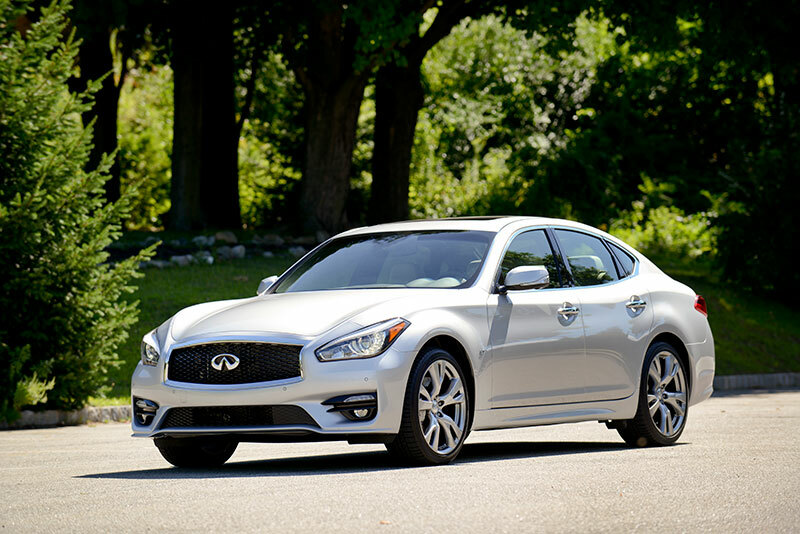 For full details and specifications on the 2015 Q70L and 2015 Q70 Hybrid, please visit InfinitiNews.com. The 2015 Infiniti Q70’s revised exterior brings it closer in look and feel to the recently introduced Infiniti Q50 sports sedan. The new dramatic design gives the premium sedan an even more upscale image. The front of the Q70 includes new LED headlights, new double-arch grille with high-quality waved mesh finish and chrome surround, new front bumper and integrated LED fog lights. The redesigned rear of the 2015 Q70 features new LED combination lights, new trunklid shape and chrome rear finisher. As in previous years, the Q70’s multi-layered exterior combines balanced, rear-wheel drive proportions and stance with a long, low hood and high rear deck to create an efficient aerodynamic shape – while also providing a roomy cabin. The Q70’s sporty appearance is highlighted by the deep body shape of the fenders and doors, which give it a powerful look unlike anything on the road. The wave-style doors are constructed from aluminum for lighter weight, despite the material’s difficult formability. The stamping dies for each door are hand polished to maintain their precision and every door undergoes an exacting human inspection, providing a handcrafted level of quality. Infiniti Q70 models equipped with the optional Sport Package also feature a revised front fascia with dark finish grille and dark headlight housings. Contributing to the low coefficient of drag of just 0.27 and zero lift front and rear are a series of aerodynamic enhancers, including front tire deflectors, engine under cover, center floor cover, rear tire deflectors, exhaust cover, floor side fairings and rear diffuser. Standard Q70 exterior features include a power sliding tinted glass moonroof with one-touch open/close, tilt feature and sliding sunshade, dual exhaust with polished tips, power-folding heated outside mirrors with reverse tilt-down feature and integrated LED turn signals, rain-sensing variable intermittent front windshield wipers and courtesy lamps built into the outside door handles. An Adaptive Front lighting System (AFS) with auto-leveling headlights is available as part of the Technology Package. The 2015 Infiniti Q70 is available in eight exterior colors: Hermosa Blue, Chestnut Bronze, Malbec Black, Liquid Platinum, Graphite Shadow, Storm Front Grey, Black Obsidian and Moonlight White with premium pearl finish. Inside the stunning exterior, the focus of the interior design is centered on the individual driving the car. The goal of the Infiniti Q70 interior is to present an elegant yet functional design that combines artistry with precision, comfort with innovation – all in support of enhancing driving performance and passenger enjoyment. The instrument panel, for example, features Fine Vision electroluminescent gauges, gear-like rings on the instrument cluster meters, a 7.0-inch color vehicle information display and Infiniti analog clock. Leather-appointed, heated 10-way power driver and front passenger’s seats including 2-way power lumbar support are standard, along with a dual occupant memory system for the driver’s seat, steering wheel and outside mirrors – which can be linked to the individual Intelligent Keys. In addition, each Intelligent Key remembers the last used climate control, audio and navigation settings. An entry/exit assist system for the driver’s seat and steering wheel, heated front seats, sequential welcome lighting illuminated entry system and dual-zone automatic temperature also contribute to the Q70’s outstanding level of standard luxury appointments. Standard technology equipment includes Bluetooth® Hands-free Phone System, Infiniti Intelligent Key with Illuminated Push Button Ignition, HomeLink® Universal Transceiver and RearView Monitor. Other interior highlights include a large center console, power windows with one-touch up/down and auto-reverse feature, power door locks with automatic locking feature, power trunk release, retained accessory power for windows and moonroof, SiriusXM Satellite Radio (SiriusXM subscription required, sold separately) and 6-speaker audio system with AM/FM/CD, Radio Data System (RDS), USB Connection Port for iPod® interface and other compatible devices, steering wheel audio controls and speed-sensitive volume control. Also standard on all 2015 Q70 models is Active Noise Control, which generates “canceling” sound from four door speakers (and subwoofer for models equipped with a Bose® sound system) to reduce unpleasant engine harmonics. The cabin noise levels are monitored by two microphones located in the Q70’s ceiling, with no action needed from the driver and passengers except to enjoy the quiet, comfortable cabin. For buyers seeking a slightly higher level of features and technology, the Premium Package adds an Infiniti Hard Drive Navigation System with 8.0-inch WVGA color touch-screen display, NavTraffic with Real-Time Traffic Information, NavWeather with Real-Time Weather and 3-day forecast (SiriusXM subscription required, sold separately) and Streaming Audio via Bluetooth®. The Premium Package also adds a Bose® 2-channel 10-speaker premium audio system, heated steering wheel, climate-controlled front seats and Rear Sonar System. The Premium Package also includes Infiniti Connection™ services, including available Automatic Crash Notification, Emergency Call, Enhanced Roadside Assistance, My Schedule, and Remote Door Lock/Unlock; and Infiniti Connection Plus including Drive Zone, Speed Alert, Destination Assistance, and in-vehicle access to Infiniti Personal Assistant – a 24/7 personal concierge service that is available at no charge for the first four years of Infiniti Q70 ownership. All Premium Package equipment is standard on Q70 5.6 models. The Deluxe Touring Package also features semi-aniline leather – full-grain leather that contains a small amount of surface coating allowing the natural character of the leather to show through. The seats are soft and firm, like premium sofa material, and offered in three available colors – Graphite, Java or Stone. Also part of the Deluxe Touring Package is specially developed soft touch material for the armrests, door inserts, center console and kneepads. The special genuine White Ash wood trim has been enhanced with real silver powder (Japanese Ash wood trim is offered on Q70 models without the Deluxe Touring Package). A total of four interior colors are offered – Graphite, Stone, Wheat and Java (availability varies with option packages). Sport Package-equipped models offer a Stone Sport color treatment with high-contrast carpet and headliner, along with unique front seat designs, sport steering wheel and shift knob stitching, and aluminum-trimmed pedals. The 2015 Infiniti Q70’s 3.7-liter V6 and 5.6-liter V8 engines are equipped with the VVEL (Variable Valve Event & Lift) system. The VVEL system combines hydraulic-controlled variable valve timing and electronically controlled variable valve lift on the intake side to help improve performance and response. Throttle response is enhanced by directly controlling the intake valve, rather than using the traditional method of controlling intake with the throttle valve. The VVEL system also offers improved emissions and fuel efficiency (over non-VVEL designs) by substantially reducing the intake resistance that occurs when the engine’s throttle valve opening is narrowed and output is low. 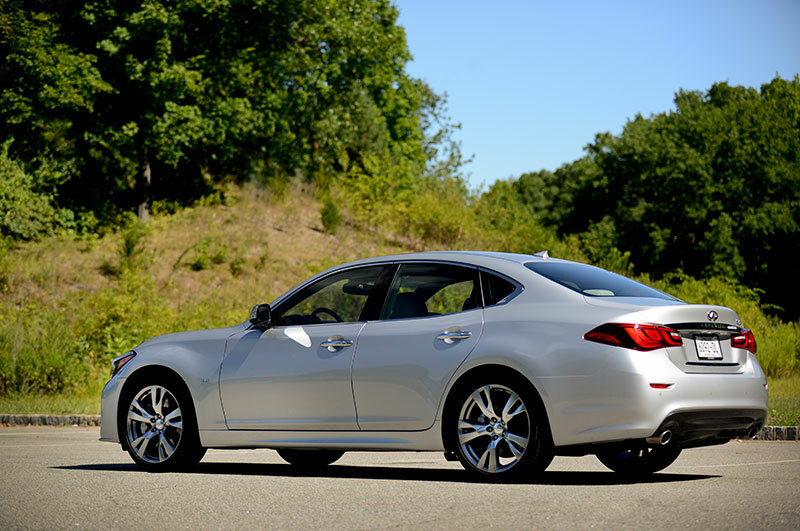 The Q70 3.7 model’s 3.7-liter VVEL, 24-valve DOHC aluminum-alloy V6 is rated at 330 hp @ 7,000 rpm, 270 lb-ft of torque @ 5,200 rpm. The engine also features rigid ladder frame construction, large crank journal and pin diameters, asymmetric piston skirts, twin knock sensors, molybdenum coated lightweight pistons, Iridium spark plugs and a symmetric twin air intake system. The Q70 5.6 model’s 5.6-liter VVEL, 32-valve, DOHC, Direct Injection Gasoline (DIG) aluminum-alloy V8 is rated at 420 hp and 417 lb-ft of torque. The DIG system provides better wide-open throttle performance and improved fuel economy and emissions performance (compared to a non-direct injection system) by reducing engine knock, improving combustion stability and offered more precise injection control. All 2015 Infiniti Q70 models come standard with Infiniti’s refined 7-speed automatic transmission with Adaptive Shift Control (ASC) and manual shift mode with Downshift Rev Matching, which allows for sportier shifts during spirited driving. Solid magnesium paddle shifters are also included in the Sport Package. Estimated fuel economy is rated at 18 mpg city/ 26 mpg highway for the Q70 3.7 and 17 mpg city/ 24 mpg highway for the Q70 3.7 AWD. The Q70 5.6 is rated at 16 mpg city/ 24 mpg highway, while the Q70 5.6 AWD achieves fuel economy of 16 mpg city and 23 mpg highway. A unique feature of the 2015 Q70 is Infiniti Drive Mode Selector, an integrated control system that allows drivers to select from four driving modes, depending on mood or driving conditions, with a dial switch located on the center console. Each mode, Standard, Eco, Sport or Snow, adjusts throttle sensitivity and transmission mapping to help optimize performance. The system also adjusts Active Trace Control and Eco Pedal settings (available with Technology Package). In addition to the standard mode (suitable for normal driving conditions), the fuel-efficient Eco mode utilizes green or amber indicator on the instrument panel to provide feedback on driving efficiency. The Eco Pedal system also provides feedback directly through the accelerator pedal, giving a slight pushback if driving inefficiently. The Sport mode increases throttle sensitivity and changes transmission shift patterns for sportier driving. The Q70 utilizes Infiniti’s advanced FM (Front Mid-ship) platform, which positions the engine behind the front axle, resulting in an optimized front-to-rear weight balance. Laser welding is performed at critical locations to help enhance lateral bending stiffness, torsional stiffness and suspension mounting point stiffness (versus the previous design). The Q70 suspension features an independent double-wishbone design in front and multi-link independent system in the rear, along with front and rear stabilizer bars. The rear suspension geometry has been designed to provide a quiet, comfortable ride. The Sport Package’s sport-tuned suspension includes double-piston shock absorbers that provide a high damping force at low frequency vibrations for a flat ride and low damping force at high frequency vibrations for a smoother ride. The Infiniti Q70’s large diameter wheels and tires are positioned out near the corners of the vehicle, helping to enhance performance. Standard 18-inch aluminum-alloy wheels and 245/50R18 all-season performance tires are offered on all models. Unique split 5-spoke 20-inch aluminum-alloy wheels with aggressive 245/40R20 low-profile tires are available with the Sport Package (summer performance for RWD, all-season for AWD). In addition, the Performance Tire & Wheel Package offers split 5-spoke 20-inch aluminum-alloy wheels mounted with 245/40R20 all-season performance tires. Every 2015 Q70 utilizes standard 4-wheel power-assisted vented disc brakes (12.6-inch front, 12.1-inch rear) with Anti-lock Braking System (ABS), Electronic Brake force Distribution (EBD) and Brake Assist (BA). The Sport Package includes larger 14.0-inch front/13.8-inch rear rotors with 4-piston front/2-piston rear opposed calipers. The steering system is an electronically controlled vehicle-speed-sensing variable-assist power rack-and-pinion design. Every Q70 includes Infiniti’s advanced Vehicle Dynamic Control (VDC) with Traction Control System (TCS). VDC automatically adjusts brake pressure and engine torque during certain situations where the vehicle is near its handling limit, helping the driver to maintain control of the vehicle. An advanced Active Trace Control system, included with the Technology Package, helps enhance the transition from braking into and then accelerating out of corners. The system utilizes the Q70’s VDC system to help improve cornering feel by automatically applying the brakes so that load is increased on the front wheels. The system also modulates engine torque. For drivers seeking the enhanced performance of all-wheel drive, the Q70 3.7 AWD and Q70 5.6 AWD models feature Infiniti Intelligent All-Wheel Drive. The system uses an advanced torque split control strategy that automatically redistributes torque to the wheels (0:100 up to 50:50 front to rear) according to road and driving conditions. The Infiniti Q70 is available with a number of innovative technologies, including Infiniti’s Lane Departure Warning (LDW) and Lane Departure Prevention (LDP) systems. Also offered are Blind Spot Warning (BSW) and Blind Spot Intervention® (BSI) systems, which are available as part of the Technology Package. BSW illuminates an indicator light if another vehicle is detected in the blind spot area. If the driver then uses the turn signal, the indicator flashes and an audible warning sounds. If the vehicle gets close to the lane marker and another vehicle is detected in the blind spot area, the indicator flashes, an audible warning sounds, and selective braking is applied to one side of the vehicle to help the driver bring the vehicle back to the center of the driving lane. BSI operates regardless of turn signal usage. Newly available for 2015 are Predictive Forward Collision Warning, which warns the driver of risks beyond the driver’s field of view; Around View® Monitor, which shows a bird’s-eye view of the vehicle in relation to parking lines (the system also includes Moving Object Detection which alerts the driver to moving objects around the vehicle); Backup Collision Intervention®, which helps detect crossing traffic as well large, stationary objects behind the vehicle and can apply the brakes momentarily to help avoid a collision; and Forward Emergency Braking, which detects danger of collision with a vehicle ahead and warns the driver with visual and audible warnings. In addition, all Infiniti Q70 models come equipped with standard Infiniti Advanced Air Bag System (AABS) with dual-stage supplemental front air bags with seat belt sensors and occupant classification sensor; standard front seat-mounted side impact supplemental air bags; and standard roof-mounted curtain side impact supplemental air bags for front and rear-seat outboard occupant head protection. The 2015 Infiniti Q70 also includes standard 3-point seat belts with Automatic Locking Retractor (ALR) and Emergency Locking Retractor (ELR) (driver’s seat ELR only), front seat belts with pretensioners and load limiters, front seat Active Head Restraints with 4-way manual adjustments, along with Zone Body construction with front and rear crumple zones and LATCH System (Lower Anchors and Tether for CHildren). 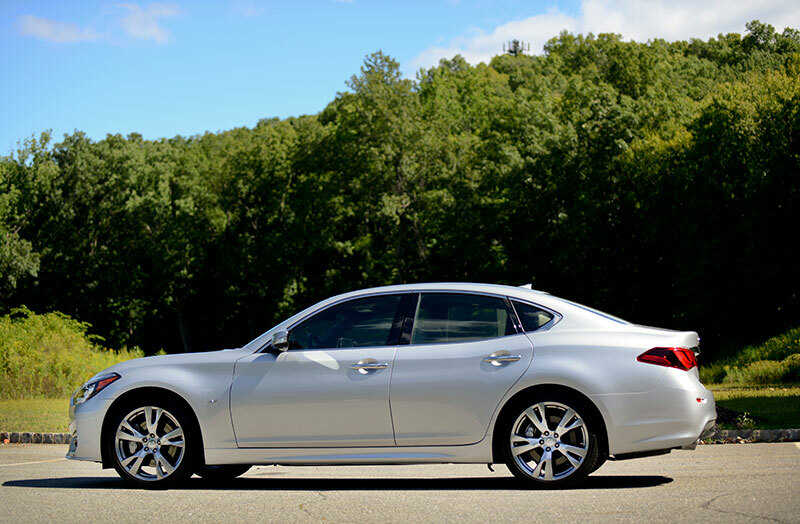 The 2015 standard wheelbase Infiniti Q70 is offered in five well-equipped models: the Q70 3.7 (V6 rear-wheel drive), Q70 3.7 AWD (V6 all-wheel drive), Q70 5.6 (V8 rear-wheel drive), Q70 5.6 AWD (V8 all-wheel drive) and the Q70 Hybrid (3.5-liter Direct Response Hybrid™ System, rear-wheel drive). In addition, eight equipment packages allow owners to custom fit their vehicles to their exact tastes: Premium Package, Deluxe Touring Package, Sport Package, AWD Sport Package, Sport Touring Package, Technology Package, Performance Tire & Wheel Package and Pearl Paint.